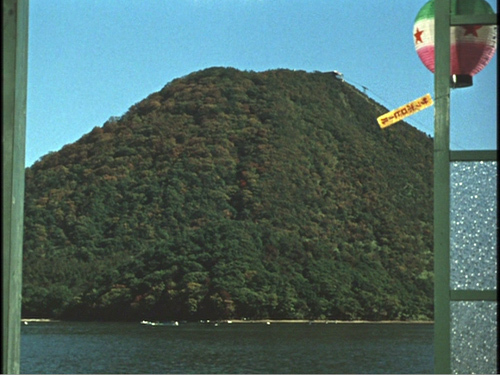 Late Autumn (Ozu Yasujiro, 1960). Manohla Dargis of the New York Times has just written a piece that refers to some ideas that have appeared on this site. If you see the article online, you’ll find the links to appropriate entries, but if you’ve come here after reading the paper edition of the Times, you can find the Tim Smith essay she cites here. It is a remarkable piece of work, and it’s gratifying that Dargis has called attention to it. (Tim’s video experiments have received many hundreds of thousands of downloads already.) My table-setting entry, on task-driven looking, is here. The backstory is simple. On this site in 2008, I took a slow, unemphatic scene from There Will Be Blood as an example of how a director can subtly guide our attention without cutting, camera movement, or auditory underlining. My analysis was guided by recognition of my own responses and some knowledge of traditions of cinematic staging. Tim, in his turn, used the tools of modern perceptual research to show that we can gain firmer knowledge of directorial craft. By tracking viewers’ eye-scanning, Tim demonstrates vividly that filmmakers can shape our experience of the action on a second-by-second basis. This not only helps us understand how we grasp images. It shows that humanistic inquiry and psychological research can collaborate. 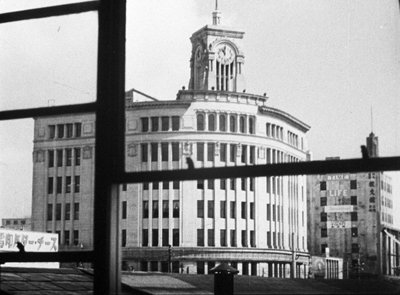 Late Spring (Ozu Yasujiro, 1949). As I get older, I find I’m suffering from a kind of culture fatigue and have less interest in eating my cultural vegetables, no matter how good they may be for me. As one man’s confession of guilt and fatigue, this is doubtless sincere, although its sideswiping putdowns of viewers who praise such movies suggest more calculation than humility. Still, this cry from the heart has broader implications, as many Net writers have discussed. Kois’ complaint elicited not one but two responses from the New York Times film critics A. O. Scott and Manohla Dargis. For one thing, Kois’ essay seems to offer aid and comfort to people who are afraid to try something different. Indeed, it lets them feel superior to the phonies who claim to like such films. Moreover, Kois justifies the most superficial response a moviegoer can make. Simply shrugging off a film by saying, “It’s boring!” is about as uninformative a response as saying, “It’s interesting!” And one should always be suspicious of somebody, in the name of debunkery, telling us that we shouldn’t bother to know something. 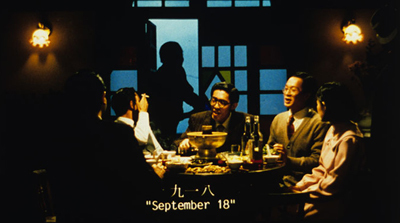 Kois’ piece exploits the special status that film enjoys in today’s culture. High and low mingle. Because movies are so accessible, and Hollywood movies are so eager to give us what somebody has decided that we want, coterie tastes are dismissed as snobbism. Things seem different in other arts. Would the Times publish a piece in which someone confessed to finding Tarkovsky’s contemporary, the Soviet composer Sofia Gubaidulina, boring? No, because to talk about her is already to enter a restricted and high-level conversation. It goes without saying that a great many listeners would be bored by her music, but who cares what non-experts think about a modern composer? Film, however, is a free-fire zone; anybody’s opinion is worth a public hearing. Surely there are die-hard Hou Hsiao-hsien fans out there who grit their teeth every time a new Pixar movie comes out. Still, Kois’ complaint touches on something important about film history. We have a polarized film culture: fast, aggressive cinema for the mass market and slow, more austere cinema for festivals and arthouses. That’s not to say that every foreign film is the seven-and-a-half hour Sátántangó, only that demanding works like Tarr’s find their homes in museums, cinematheques, and other specialized venues. Interestingly for Kois’ case, many of the most valuable movies in this vein don’t get any commercial distribution. The major works of Hou, Tarr, and others didn’t play the US theatre market. Sátántangó is just coming out on DVD here, nearly twenty years after its original appearance. Most of us can’t get access to the most vitamin-rich cultural vegetables, and they’re in no danger of overrunning our diet. 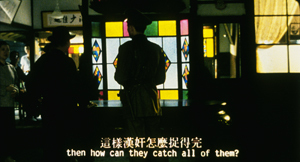 City of Sadness (Hou Hsiao-hsien, 1989). For the historian, the polarization between fast pop movies and slow festival films asks to be explained. My take goes roughly this way. But artists being artists, competition grew up. The long take, for instance, got longer and more virtuosic. Miklós Jancsó, shamefully ignored today, made a series of pageants of Hungarian history in superbly sustained, intricate camera movements; some of his films have only twelve shots. But his films are sumptuous compared to what we found elsewhere. From the late 1960s through the 1970s, it seems, a new generation of filmmakers competed to make ever more austere films. They often kept the camera fixed, framed the action at a distance, and sustained the shot for many minutes. The works of Jean-Marie Straub and Danièle Huillet are the high-water marks of this trend, but there were also Chantal Akerman, Theo Angelopoulos, and even Rainer Werner Fassbinder (Katzelmacher) and Wim Wenders (Kings of the Road). Werner Herzog’s successful career as a documentarist has perhaps let people forget that he once made very slow and demanding films like Fata Morgana; his Heart of Glass, screened in US arthouses in the 1970s, would surely not find a distributor today. From a marketing standpoint, the avant-garde overplayed its hand. The new austerity came along just when Spielberg and Lucas were reinventing Hollywood. As movies got faster and louder, long-take minimalism looked perversely ascetic. Some of the directors, like Straub and Huillet, remained loyal to their project; others crossed over. It is quite a shift from Akerman’s Jeanne Dielman, 23 quai du Commerce, 1080 Bruxelles (1975), a 201-minute film mostly about housework, to the musical The Golden Eighties (1986) and A Couch in New York (1996). Likewise with Wenders’ Summer in the City (1970) and Wings of Desire (1987). I happen to admire both strains in these directors’ works, but there’s no doubt which is the more audience-friendly. Today, directors who persist in long-take, slowly-paced storytelling are aiming chiefly at the festival market, which means that most of their films will be shown theatrically only, to be blunt, in France. But some of the greatest directors of our time, notably Hou Hsiao-hsien, Edward Yang, and Abbas Kiarostami, have done their best work in this mode. The US arthouse market has taken decades to discover them, through more accessible works like Flight of the Red Balloon, Yi Yi, and Certified Copy. Kois confesses to loving Yi Yi, so I’d urge him to look at Yang’s Terrorizers and A Brighter Summer Day, more rigorous but no less gripping films, though they lack the traditional arthouse bait of a charming child. Hou’s Red Balloon also has a cute kid and refers back to an arthouse classic, while Kiarostami, not normally given to couples and romances, offers us in Certified Copy a pleasantly teasing take on Antonioni and Resnais. Minimalism of the 1970s variety got revived by 1980s American indies, notably Jim Jarmusch, but with more entertainment value. In later years he too crossed over stylistically; however unpredictable the plot maneuvers of Ghost Dog and Broken Flowers, they lack the long takes and open-ended unfolding of time we find in Stranger than Paradise. Even Kelly Reichardt, one of Kois’ targets, doesn’t give us anything like the severity of the 1970s generation. That makes the “purer” films from overseas that persist in this tradition even more off-putting. If Kois can’t take Meek’s Cutoff, as he claims, he’d find Hong Sangsoo (Oki’s Movie) or Liu Jiayin (Oxhide and Oxhide II) cinematic chloroform. So Kois may assume that “boring” films have persisted in today’s film culture because of snobbism, but there are deeper reasons. The competition among filmmakers to push an aesthetic horizon further, the narrowing of audience tastes, the search for a budget-appropriate niche that could stand in opposition to the visual spectacle of the New Hollywood–these seem to me important factors in making slow movies a ghetto for cinephiles. Why shouldn’t people follow Kois in giving up their vegetables? No reason, except that they’re missing some worthwhile cinematic experiences. Not all austere movies are good, but viewers who want to expand their cinematic horizons should consider the possibility of learning to look at certain movies differently. Kois can’t see that; he thinks that people who like the movies that bore him are usually phonies. But I believe that some of those admirers have developed a repertory of viewing habits that adjust to different cinematic traditions. If you can like both Stravinsky and rock and roll, why can’t you like Hou and Spielberg? 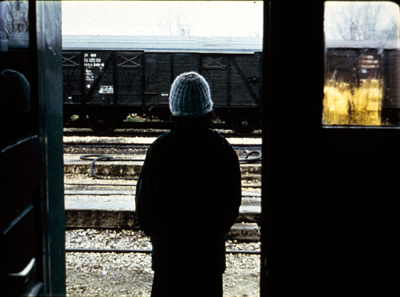 Voyage to Cythera (Theo Angelopoulos, 1984). This is the prospect opened up by Dargis’ latest article. She suggests that Kois’ response isn’t wholly based on taste. It may stem from literally not knowing how to look at certain kinds of movies. Kois’ article treats most defenses of slow films as a matter of hand-waving and you-see-it-or-you-don’t attitudinizing. Again, he has a point: Those reactions are common, I think. The fact that cinephiles must face is that this sort of film is very difficult to talk about. We can point out the creative choices in Hollywood because narrative in some degree drives everything we see and hear. But when narrative relaxes, most viewers don’t know what to look or listen for. The problem has haunted me for decades, ever since the 1970s when I took an interest in Ozu, Bresson, Dreyer, and Mizoguchi–all filmmakers felt, at the time, to be slow. I failed to come to grips with the problem in my 1981 book on Dreyer; I even anticipated Kois in calling Gertrud (another item that would never grace theatre screens today) boring–but I took that to be a good thing, as a challenge to conventional viewing habits. What can I say? I was young. Since then, I think I’ve come up with better ways of talking about the other directors I mentioned, as well as some in their camp, such as Angelopoulos and Hou and Tarr. A lot of my answer comes down to the way, pace Dargis and Smith, they structure our attention. My arguments are set out in the places I mention in the tailpiece of this entry. In brief, these filmmakers become engaging, even entertaining, when we realize that they are to some extent shifting our involvement from characters and situations to the manner of presentation. Not narrative but narration is what engages us. And we need, as Dargis points out, some schemas for grasping these alternative patterns. We have robust and refined schemas for following a story, but grasping the dynamics of narration, the how as well as the what, takes more practice, and perhaps some instruction from critics. The process is like taking in an opera on two levels: following the stage action but also registering the patterns, the emotional highs and lows, of the music that accompanies–and sometimes overwhelms–it. Let Papagena and Papageno stammer each one’s name again and again. The repetition isn’t needed for the drama, but it’s thrilling on sheerly musical grounds. Now imagine that sort of development transposed to cinema, in which we can appreciate, at one and the same time, not only the story’s unfolding but the patterns that present it. The supreme master of this possibility, I think, is Ozu, perhaps cinema’s Mozart. But you can find the same qualities in more somber key elsewhere. 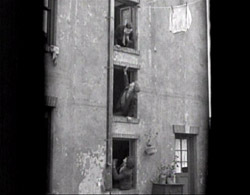 For example, in watching Angelpoulos’ Voyage to Cythera, I think that you have to be prepared to see the arrival of track workers in yellow slickers, visible through the speckled window pane in the shot above, as a kind of visual epiphany, the quiet equivalent of a stunt in a summer tentpole picture. Given a narrative mandate, we’re on the lookout for pictorial factors that affect the dramatic situation. But when narrative slows, other things, maybe not of narrative moment, pop out, like the yellow-garbed train workers on their handcar. At such moments, it’s not that our eyes roam around aimlessly; it’s that the director guides us in a different way, toward a visual search that isn’t wholly driven by plot considerations. Here’s a shot from Ozu’s End of Summer (1961). The principal action is a party of young people singing. But the faces are no more important than the gleaming drinks on the table, a little suite of colors and shapes that become fascinating in themselves. (For instance, several of the liquids and bottle labels sit along the same horizon line, regardless of how far the drinks are from us.) You don’t discover this half-gag, half-still-life by groping: Ozu has lit it and composed it so that you’re invited to discover it. He has found a way to activate what in most movies would be filler material. And if you think that noticing colors and shapes on the tabletop is just trivial, consider that we enjoy staring at the same sorts of patterns in an abstract Kandinsky. Or is he cultural roughage too? In an Ozu film, even though he cuts rather fast, we’re given time to see everything. But this isn’t random rummaging. 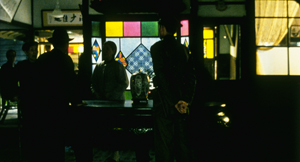 It’s visual exploration guided by Ozu’s decisions about composition, lighting, and color. Something similar, I think, is going on with Tarr, although there it’s more a matter of texture and tactile qualities. His people shamble through mud, oily puddles, dusty corners, and tearing winds. In one shot of Damnation, a rain-soaked wall shrivels to match a wrinkled topcoat. The story is still going forward, but by turning his protagonist from us and aligning him with the wall, Tarr has given his shot an extra layer of sensuous appeal. Try to remember the way any wall looked in Transformers 3, before it got blasted to rubble. Slow movies let us look around, and good slow-movie makers give us something to see when we do. But what do we do when these accessory appeals don’t just accompany the narrative but swamp it? What if we lose track of the characters? The film may steer us to pictorial or auditory qualities that take over our perception. The authorities are looking for a man in the family in Hou’s City of Sadness, but you have to rely almost solely on dialogue to identify what’s going on and who’s speaking. 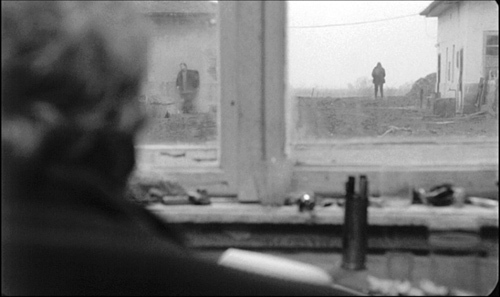 The sheer pictorial beauty of the shot becomes a sort of anti-narrative pretext. But if you’re alert, you won’t take the plot off the table, because at one crucial moment a figure flashes through the far left background, more or less fully lit, who may be the suspect the cops are seeking. Sometimes you have to destroy narrative in order to save it. Hou asks that we engage with his distant, fixed images in a complex way, being patient but vigilant, enjoying abstract geometry while also sustaining old-fashioned suspense. It’s this dynamic between story and style, fastening on plot elements but also discovering accessory pleasures and patterns, that I think constitutes one delight of the sort of films that Kois finds boring. Add Bresson, Mizoguchi, Dreyer, Tarkovsky, and others to my list of directors whose very different styles invite us to explore what the rapid pace of most narrative cinema refuses to dwell upon. These filmmakers invite us to grasp the space and time of a scene in a fresh way. The details and dimensions of a world surge forward, not simply as a backdrop for characters hurtling toward a goal, but as something valuable in their own right. For some viewers, me included, they do more. They also ask you to transfer those viewing skills to life outside the theatre. They encourage you to find a new way to look at our world. Not all slow, minimalist movies are good. That’s why I think critics are obliged to rebut Kois with careful analysis, not the gaseous generalities about sublimity and eternal mystery to which we too often resort. Digging deeper, we can not only answer skeptics but expand our understanding of how cinema works. These films have opened windows for many of us. Why should we keep them to ourselves? First, thanks to Manohla Dargis for enjoyable correspondence about these issues. Tim Smith’s blog, Continuity Boy, is a good way to keep up with his energetic and expanding research program. Dargis mentions the invisible gorilla experiments of Chabris and Simons. I talk about their relevance to film here and here. Kristin has written on comparable matters in Tati; she even wrote an essay on M. Hulot’s Holiday called “Boredom on the Beach.” (It and an essay on Play Time are in her book Breaking the Glass Armor.) Tati’s films, in their spasmodic pauses and shamelessly repeated or sustained gags, could also count as part of the postwar dedramatization trend. My initial arguments about different registers of viewer perception and cognition were made in Narration in the Fiction Film (1985). My case for Ozu is in Ozu and the Poetics of Cinema, available online. More recently, I’ve become interested in cinematic staging and have concentrated on challenging directors like Mizoguchi, Angelopoulos, and Hou; see On the History of Film Style (1998) and Figures Traced in Light (2005). All of these “slow” filmmakers ask us to be sensitive to unusual sorts of narrative patterning, and some purely non-narrative patterning. More thoughts on these matters can be found in The Way Hollywood Tells It (20006) and Poetics of Cinema (20007). On this site, you can find similar lines of argument, especially about Béla Tarr, Mizoguchi Kenji, and silent directors like Louis Feuillade, Victor Sjöström and some Danish creators. See director entries for Hong Sangsoo, Liu Jiayin, and others mentioned above. Later this month I hope to post a bit more about how directors guide our attention without recourse to fast-paced editing–before editing was really invented. Two entries are enough to create a tradition. Once again, at a time of year when critics are picking their 10-best lists for 2009, we jump back ninety years and give our choices for 1919. I remarked in last year’s post that it was a bit difficult to come up with ten films, a result perhaps of accidents of preservation or slackening of activity by certain major filmmakers. There was no such problem for 1919, and films had to be bumped off the initial list to keep it to ten. (In fact, you’ll notice we didn’t quite manage to keep it to ten.) Since some people may take these lists as a guide to exploring the cinema of the teens, we’re adding some also-rans at the end, all very much worth watching. With 1919, we’re approaching the decade when many of the most widely known silent classics were made. Some titles on this year’s list will be very familiar. Erich von Stroheim’s first film came out in 1919, as did Carl Dreyer’s. Ernst Lubitsch, always a prolific director, was particularly busy that year. Other titles are less well-known, still being largely the province of silent-film festivals and archival research. Three, sadly, are not available on DVD, and some others have to be ordered from sources in their countries of origin. In this day of internet sales around the world, such orders are not difficult. You need, however, a multi-region DVD player. Cecil B. De Mille had begun his series of high-society battle-of-the-sexes films by this point. Male and Female differs from the others in that it is based on a prominent literary source, The Admirable Crichton, J. M. Barrie’s successful 1902 play. The plot involved the butler of a wealthy British family. He becomes their leader when the pampered group is cast away on an unpopulated island. 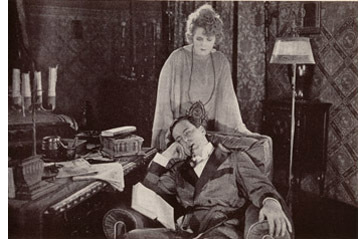 A romance develops between the spoiled daughter, Lady Mary (Gloria Swanson), and Crichton (Thomas Meighan). 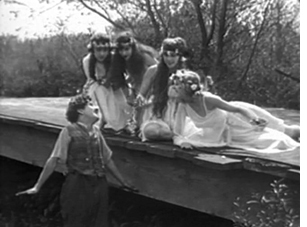 De Mille spiced up the story with a fantasy scene based on William Ernest Henley’s popular poem of 1888, “I was a King in Babylon.” It dealt with reincarnation, one of several spiritualist fads of the period, which also included psychic contact with the dead and the fairy photographs that deluded Sir Arthur Conan Doyle. Crichton refers to the poem, leading into a scene of him as king in a Babylon. When a Christian slave girl rejects his advances, he orders her thrown to the lions. 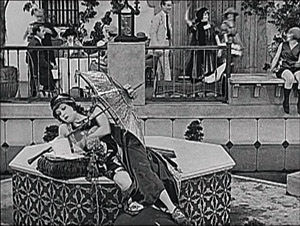 The scene providesa glimpse of the costume-epic style that De Mille would increasingly turn to as his career advanced. Henley, by the way, is largely forgotten today, but another of his poems, “Invictus,” inspired Nelson Mandela and lends its name to the latest Clint Eastwood film. D. W. Griffith released an impressive lineup of features in 1919, despite the fact that he was also acting as the producer for other directors. His output includes a charming set of pastoral stories A Romance of Happy Valley, True Heart Susie, and The Greatest Question; a belated war film, The Girl Who Stayed at Home; a Western, Scarlet Days; and a melodrama that ranks among his most admired films, Broken Blossoms. Griffith’s status within the industry was reflected by the fact that this same year same the formation of United Artists as a company to distribute films by him and the other founders, Chaplin, Mary Pickford, and Douglas Fairbanks. Broken Blossoms owes its simplicity to the fact that Griffith was then making a series of films based on short stories. The title of Thomas Burke’s “The Chink and the Child” sounds offensive today, but it was an ironic reference to the epithet forced upon an idealistic young Chinese man who comes to London’s grim Limehouse district and becomes disillusioned. He falls in love with the delicate Lucy, abused by her violent, drunken father. These three form the main characters. Another Chinese man lusts after Lucy, but for once in Griffith’s work, the sexual threat to the innocent heroine takes second place to her abuse by her father. Lillian Gish and Richard Barthelmess convey the quiet resignation that at intervals gives way to Donald Crisp’s vicious outbursts. Apart from the strong performances from the three leads, the film was perhaps the first to consistently use the “soft style” of cinematography, an approach that borrowed from a recently established trend in still photography. The hazy views of the Chinese setting in the opening and of the Limehouse docks later on would be enormously influential on films of the 1920s. Raymond Longford is far and away the least known of the directors in this list. Films were increasingly being made in countries outside the U.S. and Europe, but few have survived. 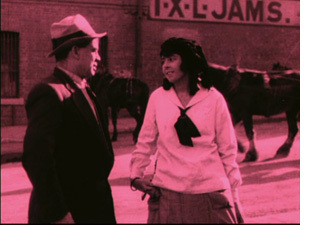 Longford’s The Sentimental Bloke is widely held to be the first major Australian film and perhaps the best of the silent era. 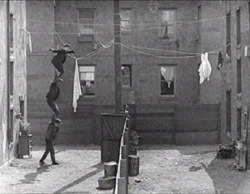 Based on a verse poem using vernacular language and serialized from 1909 to 1915, it was set among working-class characters and filmed on location in an inner-city district of Sydney. It follows the reformation of the Bloke, a drinking, gambling man reformed by his love for Doreen. 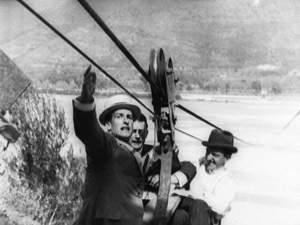 The film’s original intertitles, based on the poem and told in first person by the hero, were too colloquial for Americans to comprehend, and the film failed there, even after a new set of intertitles were substituted. When I was studying film in graduate school, Ernst Lubitsch’s German period was known mainly for the 1919 historical epic Madame Dubarry. There was little known about the two comedies that came out that year, perhaps the most amusing and delightful of all his German films in this genre: Die Austernprinzessin (“The Oyster Princess,” though seldom called by that title) and Die Puppe (“The Doll,” also a little-used name). It’s hard to choose which of these three is Lubitsch’s best for the year. Ironically Madame Dubarry isn’t watched much any more, and it’s not on the recent DVD set “Lubitsch in Berlin,” though the two comedies are. Complete prints are rare, due in part to censorship. (If the print you see ends with a close-up of the heroine’s head held up after she is executed, you’ve probably been watching a reasonably complete version.) It may seem a bit stodgy upon first viewing, but I warmed up to it during repeated screenings while researching my book on Lubitsch’s silent films. There are many excellent moments: the extended series of eyeline matches when Louis XV first sees Jeanne, the masterfully timed and staged long take when Choiseul refuses to let Jeanne accompany Louis’s coffin, and a meeting among the revolutionaries that ends as Jeanne reacts in horror to their bloodthirsty plans, backing dramatically into shadow in the background (below). Given how different these films are, I’m going to declare a tie between Madame Dubarry and one of the comedies. Wonderful though The Oyster Princess is, I’m opting for Die Puppe (above). Its story-book opening and stylization are charming. The hilarious scenes in the doll workshop and the monastery full of greedy monks fill out the plot, making it considerably denser than that of Die Austernprinzessin. 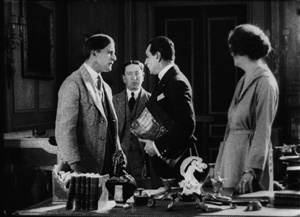 As with Lubitsch, when I was first studying film and for many years thereafter, Swedish director Mauritz Stiller was known mainly for one film, Sir Arne’s Treasure (Herr Arnes Pengar), though an abridged version of The Saga of Gösta Berling also circulated. Sir Arne’s Treasure was assumed to be his masterpiece. The gradual rediscovery and restoration of other Stiller films from the 1910s has considerably broadened our view of him. Perhaps Sir Arne’s Treasure is not the solitary, towering masterpiece it was long thought to be. Still, it holds up well upon revisiting. It is a period piece set in a small seaside community. A group of foreign men massacre most of a family, in search of their mythical riches. They are forced to remain in the village when the ship in which they are to sail becomes icebound. The surviving daughter of the family unwittingly falls in love with one of the killers. 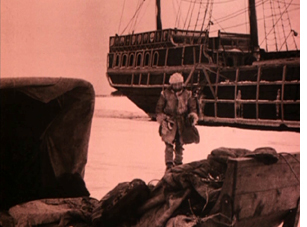 Sir Arne’s Treasure was one of the films which gained the Swedish cinema of the 1910s the reputation for brilliantly exploiting natural landscapes. 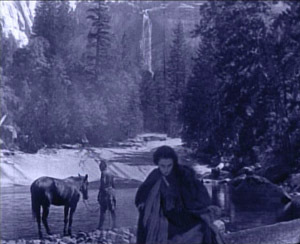 Few silent films have exploited actual winter settings so well. The actors are clearly working in genuine snow; one can sometimes see their breath fog as they speak. Atmospheric shots show the wind sweeping snow across the ice. Stiller uses the blank backgrounds created by the snow to create stark, simple compositions of dark figures and objects. Kino’s DVD release uses a print from Svensk Filmindustri’s own archives. To my eye, the tinting used is too dark, especially since much of the action naturally takes place in the dark of the northern winter days. Deep blues somewhat obscure parts of the action. Still, the darkness adds to the brooding tone that pervades the story. Maurice Tourneur’s Victory runs a mere 63 minutes in its current version, but the original footage count suggests that what we have is substantially complete. That’s somewhat short for a feature by a major director at this point in history, but the simple, intense plot, based on a Joseph Conrad short story, benefits from the compression. The protagonist is a man who has escaped his past and lives as a virtual hermit on a South Seas island. Attracted despite himself, he befriends a young woman playing in a visiting orchestra and rescues her from the abuse of the orchestra’s owner and the lustful advances of the local hotel owner. Returning with the woman to his lonely island, he faces the intrusion of three thugs deceived by the vengeful hotel owner into thinking that the hero has riches hidden on his island. Since then, David has found an earlier one that sort of qualifies (maybe more on this in an upcoming entry), but this is a purer case. Tourneur had also developed a distinctive approach to filming settings in long shot with framing elements within the mise-en-scene and figures silhouetted in the foreground (see top). In general the lighting is superb. Few Hollywood directors had reached this level of sophistication by 1919. Victory has been released on DVD largely because it features Lon Chaney as one of the thugs. 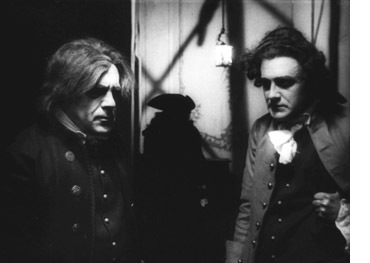 Image offers it paired it with another Chaney film. For some reason the titles are out of focus, but the rest of the film fortunately is in good condition and presents Tourneur’s visual style well. Carl Theodor Dreyer began his film career writing scripts at the powerful Danish studio Nordisk. When he started directing, however, World War I had destroyed Nordisk’s markets, and the American cinema was on the rise. Dreyer’s generation was the first to register the impact of the emerging Hollywood cinema, and he displayed his understanding of Griffithian technique in The President (Praesidenten). The English title should probably be something like “The Head Magistrate” or “The Presiding Judge,” and the plot appropriately sets up a tension between justice and personal obligation. 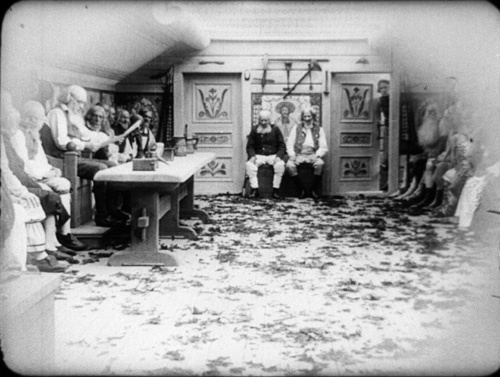 One of Nordisk’s favored genres was the “nobility film,” in which illicit passion plunges a wealthy man or woman into the lower depths of society. Dreyer gave the studio a nobility film squared, using flashbacks to show how two generations of men in a family have seduced working-class women. The present-day drama displays the crisis that ensues when a respected judge realizes that the woman to be tried for infanticide is his illegitimate daughter. Dreyer’s abiding concern for the exploitation of women under patriarchy begins in his very first film. 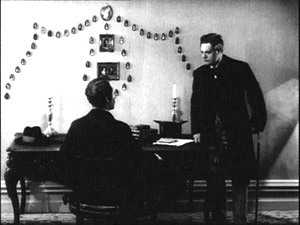 From the early 1910s, Danish films displayed a mastery of tableau staging and careful pacing. But The President bears the mark of American technique in its bold close-ups and reliance on editing to build up its scenes. (There are nearly 600 shots in the film, yielding a rate of about 8.8 seconds per shot—quite swift for a European film of the era.) Perhaps more important are Dreyer’s efforts to shove aside the heavy furnishings of bourgeois melodrama. Compare the overstuffed set of Hard-Bought Glitter (Dyrekobt Glimmer, 1911) to this daringly bare one, with its sweep of cameos. In the late teens, other Danish directors were moving toward simpler settings, but The President carries this tendency to geometrical extremes. Dreyer’s walls, bare or starkly patterned, isolate the players’ gestures and heighten moments of stasis. The result is one of the most adventurously designed film of its time, and if some of its experiments do not quite come off, already we can see that impulse toward abstraction that would be given full rein ten years later in La Passion de Jeanne d’Arc. The all-region DVD from the Danish Film Institute provides a somewhat dark tinted copy with original intertitles and English translations. Dreyer deeply admired Victor Sjöström, who had already given Swedish cinema some of its enduring masterpieces: Ingeborg Holm (1913), Terje Vigen (1917), The Girl from Stormycroft (1917), and The Outlaw and His Wife (1918). Sjöström would go on to make The Phantom Carriage (1921), The Scarlet Letter (1926), and The Wind (1928). Several other outstanding movies he signed remain little known; worth watching for are The Girl from Stormycroft (1917), Karin Ingmarsdotter (1920), and the deeply moving Mästerman (1920; look for this on our list next year). Among these unofficial classics Sons of Ingmar (Ingmarssönerna, 1919) stands out especially. A prologue shows lumbering, somewhat thick-headed Ingmar climbing a ladder to heaven, where generations of Ingmars sit in dignity around a massive meeting-room (see below). There his father tells him that he must find a wife. But Ingmar then explains that he once took a wife, with unhappy results. Some long flashbacks ensue, showing Ingmar forcing a young woman to marry him. The plot takes some doleful turns, with the result that the woman is sent to prison. Running over two hours (and initially released in two parts), Sons of Ingmar has a fittingly lengthy climax that portrays the pains of reconciliation between a sensitive woman and an inarticulate man. In the film’s final scenes, Sjöström risks a delicate emotional modulation that would daunt a director today. Using Hollywood continuity cutting with a casual assurance, he relies on subtly timed cuts and changes of shot scale to trace the couple’s wavering guilts and hopes. These last scenes have a human-scale gravity that balances the weighty paternal authority of the heavenly sequences. In Theatre to Cinema our colleagues Lea Jacobs and Ben Brewster have written a penetrating analysis of the performances of Sjöström as Ingmar and Harriet Bossa as Brita. Unhappily, we know of no video version of this wonderful film. It should be a top priority for DVD companies specializing in silent cinema. Another 1919 candidate for ambitious DVD purveyors is Louis Feuillade’s great serial Tih Minh. It has been overshadowed by Fantômas (1913-1914), Les Vampires (1915-1916), and Judex (1917), but it has a playful charm of its own. It is, in a way, the anti-Vampires. Instead of chronicling the triumphs of an all-powerful secret society, this six-hour saga gives us a few ill-assorted conspirators who inevitably fail at every scheme they try. The plot is no less far-fetched than that of the earlier serial, but the twists are more comic than thrilling. (Which is not to say that we’re denied some astonishing real-time stunt work performed by the actors, as above.) The film’s genial tone assures us that nothing bad will happen to the poor girl Tih Minh, but the villains will get enjoyably harsh punishment. In the course of the adventure three couples are formed, the routines of provincial life are filled in with leisurely detail, and the whole thing ends with a big wedding. Unlike the Paris-bound serials, Tih Minh allowed Feuillade to apply his elegant staging skills to natural landscapes. By now he was filming in Nice, and the chases and fistfights are enhanced by gorgeous mountains, vistas of water, and hairpin roads. More than one connoisseur has confessed to me that this is their favorite Feuillade serial, and it’s hard to disagree. I always find that viewers are carried away by its zestful tale of good people who come to a good end. DB’s runner-ups: Perhaps not as fine as the above, but definitely of bizarre interest, are two Robert Reinert films from 1919. The title of Opium pretty much sums up this fevered movie. 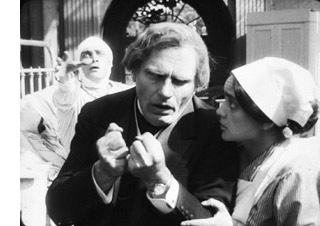 It includes sinister Asians, drug-addled doctors, a lions’ den, and Conrad Veidt in a suicide-haunted performance that makes his Cesare role in Caligari look underplayed (see right). Later in the same year Reinert gave us an even more overwrought tale, Nerven. This is a movie about collapse–the collapse of a community, of a business, and of the tormented minds of buttoned-up citizens. Reinert renders melodrama in images of controlled frenzy unlike any others I know from the period. Had his films been as widely seen as the official Expressionist classics, I think he would be much admired today. 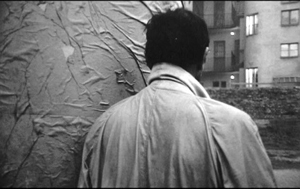 I analyze these two movies in Poetics of Cinema, and say a bit about them in this entry. A DVD of Nerven is available from the Munich Film Archive. Last year I put Marshall Neilan’s Mary Pickford vehicle, Stella Maris, in the top ten. I’d be tempted to do the same with his (and her) Daddy-Long-Legs, but this year there’s a lot more competition. But it’s a charming film, and the great cinematographer Charles Rosher provides another series of beautiful images using the new three-point lighting system. It was the first Pickford film into Germany after the war and considerably influenced Lubitsch and other German directors. 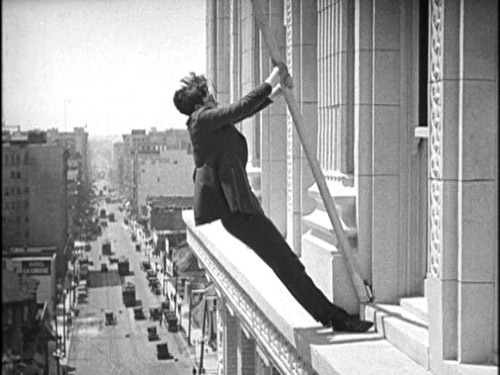 Similarly, in a year with fewer major films, Victor Fleming’s When the Clouds Roll By, a wacky, inventive tale of superstition and psychological manipulation starring Douglas Fairbanks, would make the main list. David illustrated some of that inventiveness in his epic entry on Fairbanks. Within a few years, compiling our 90-year picks will become increasingly difficult. Experimental cinema will blossom, as will animation. The Soviet Montage and German Expressionist movements will get started, and French Impressionism, still a minor trend in the late teens, will expand. Filmmakers like Murnau, Lang, Vidor, and Borzage will gain a higher profile, and more films by veteran directors like Ford will survive. Maybe we’ll have to expand the annual list even further. . . .
A very happy New Year to all our readers! Assuming we make it through the security lines, we shall be celebrating New Year’s Eve on a plane bound for Paris, where David will be doing a lecture series over the first few weeks of January. Paris is the world capital of cinema, at least as far as the diversity of films on offer goes, so we shall no doubt find occasion to blog while there. We ended 2007 with a salute to the 90th anniversary of the solidification of the classical Hollywood filmmaking system. 1917 was not only the year when all the guidelines—continuity editing, three-point lighting, and unified story structure—gelled in American cinema. It was also one of those years (like 1913, 1927, and 1939) when a burst of creativity took place internationally. For those years, it’s hard to keep one’s greats list to ten. Enough of you enjoyed that entry that we thought we would come up with another list to end 2008. For some reason, 1918 doesn’t yield the plethora of great films that obviously should go on such a list. Maybe it’s the sheer accident of preservation. After a string of masterpieces from Douglas Fairbanks in 1917, there seems to be a dearth of his films extant from the following year. Some filmmakers, like Cecil B. De Mille, simply released fewer films in 1918. And of course, some masterpieces may still lie gathering dust on archive shelves, waiting to be discovered. Still, great films were made that year, some familiar—some that should be better known. Some are available on DVD, and some are excellent candidates for release by some of the enterprising companies like Kino International, Image Entertainment, and Flicker Alley. 1. 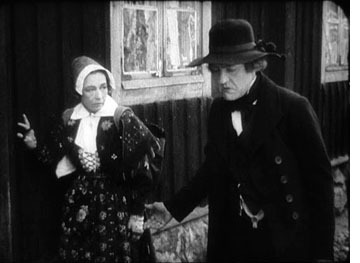 The list isn’t in rank order, but for me the outstanding film of 1918 is Berg-Ejvind och hans hustru, better known to most as The Outlaw and His Wife, by Victor Sjöström. 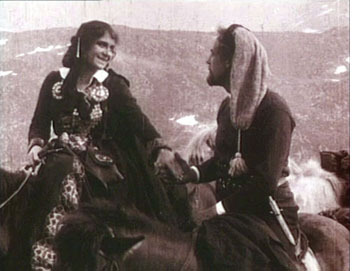 This tale of an enduring love between a man hunted by the police and a rich landowner who falls in love with him, and, as one title says, “Hearth and home and every man’s respect—she gave it all up for his sake.” The result is one of the cinema’s great romances as the pair flees to the mountains and spend the rest of their lives amidst the natural landscapes that create spectacular backdrops for the action. This year Kino also brought out a disc with the dynamite double bill of two tragedies Ingeborg Holm (1913) and Terje Vigen (1916). 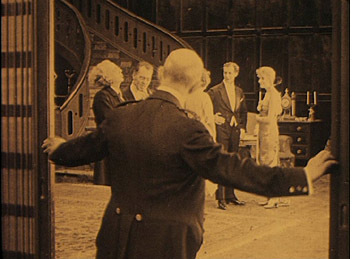 David and I have both written about the staging in Ingeborg Holm, and David has had much to say on tableau staging in 1910s cinema. Watch these three films, and you will understand why we consider Sjöström perhaps the great director of the decade. It’s a shame that more of his films are not available yet in the U.S. Buy copies of these, and maybe Kino will bring more of them out. 2. Another master of this era, Louis Feuillade, made a sequel to his Judex (1916): La Nouvelle Mission de Judex. David discusses both in the second chapter of his Figures Traced in Light. Although Judex is available on DVD, so far the second serial is not. 3. 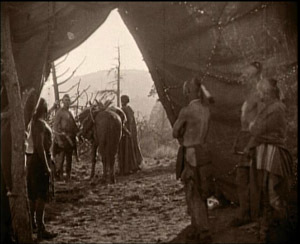 I suspect that Hearts of the World is one of those D. W. Griffith features that a lot of film enthusiasts have heard of but not seen. Remarkably, it’s not available on DVD. (Keep your old laserdisc if you’ve got one!) I have to admit, it’s not one of my favorite Griffiths, though it does have a charming performance by Dorothy Gish and contains scenes that were actually shot near the front lines in France. 4. 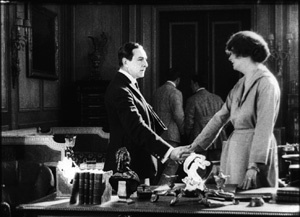 Ernst Lubitsch was making the transition from shorts to features in 1917 and 1918. While Carmen is historically important for his development toward his mature style, most audiences these days would probably find Ich möchte kein Mann sein (“I don’t want to be a man”) more entertaining. It’s a comedy about an independent young lady who escapes her strict governess and guardian by going out on the town disguised as a man—in the process joining her guardian without his recognizing her (see the frame at the bottom). Its star, Ossi Oswalda, was an outgoing blonde dynamo, quite different from Pola Negri, whom Lubitsch turned to for his later historical epics. 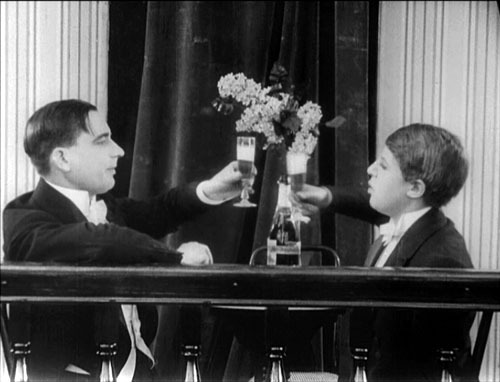 Kino has made several of Lubitsch’s films from the late 1910s and early 1920s available. 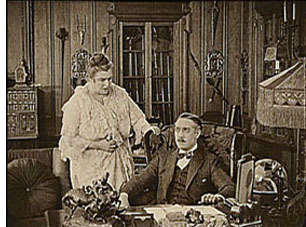 Ich möchte kein Mann sein can be bought on a single disc with Die Austerinprinzessin (“The Oyster Princess,” 1919), another Oswalda comedy. I’d recommend getting it as part of the larger “Lubitsch in Berlin” set, which also includes the hilariously imaginative Die Puppe (“The Doll,” 1919), the Expressionist satire Die Bergkatze (“The Wildcat,” with Negri in her one comic role for Lubitsch, 1921), an Arabian-nights epic Sumurun (1920), and the historical epic Anna Boleyn (1921), as well as a documentary on Lubitsch. 5. In 1918 Cecil B. De Mille made a film that would change his career’s trajectory: Old Wives for New. At the time, this romantic drama that seemed risqué in its casual depiction of adultery, golddiggers, and especially divorce as creating a happy outcome. Up to that point De Mille had been working in a whole range of genres, creating imaginative films that helped define the classical style. The success of Old Wives for New led him to specialize in spicy romances known for their haute couture costumes. 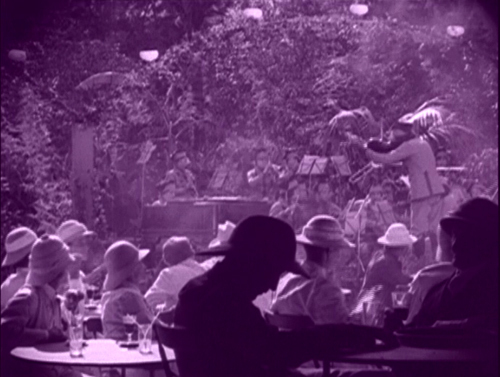 The film is available on a disc from Image that includes De Mille’s other major film of 1918, The Whispering Chorus. 6. Hell Bent, by John Ford, was long thought to be among his many lost westerns from the early years of his career. 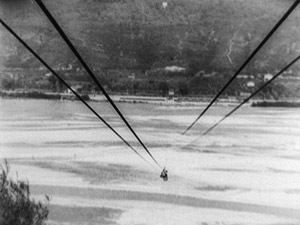 It was rediscovered in the Czechoslovakian archive and shown years ago in Pordenone at the Il Giornate del Cinema Muto festival. I must confess that I don’t remember it very well, apart from one spectacular tilt downwards as a stagecoach (?) races down a winding mountain road. Not as good as Straight Shooting, and Hell Bent survives in rocky shape (perhaps too much so for DVD release), but Ford films of this era are so rare that I’ve listed this one. 7. Like Lubitsch, in the late 1910s Charlie Chaplin was making a gradual transition from shorts to features. In 1916 and 1917 he released a remarkable string of Mutual two-reelers, from The Rink (December 1916) to The Adventurer (October 1917). In 1918, with A Dog’s Life and Shoulder Arms, he increased the films’ length to three reels, or roughly 45 minutes, and started releasing through First National. He also cut back on the number of titles released each year. Apart from a brief promotional film for war bonds, A Dog’s Life and Shoulder Arms were his only 1918 releases. Which is better? I suppose most people would say Shoulder Arms. To me it’s a toss-up. 8. David and I started attending Il Giornate del Cinema Muto in 1986, when the festival was launching its great series of national retrospectives. In quick succession, these retrospectives revealed three hitherto virtually unknown but major auteurs of the 1910s: the Swede, Georg af Klercker, in 1986; the Russian, Evgeni Bauer, in 1989; and the German Franz Hofer, in 1990. Bauer’s career ended with his death in 1917. Hofer remained active until the early 1930s. 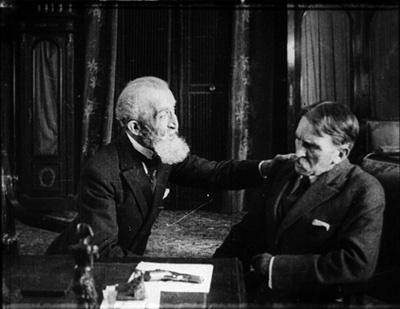 The Giornate’s German program contained only six of his films, however, and those from the 1913-1915 period. I suspect that means the later teens titles are lost. In contrast, nearly all of af Klercker’s films survive, mostly in the original negatives. The prints shown at Pordenone were stunning. 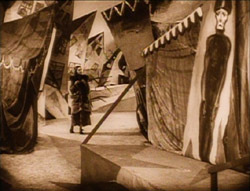 The director had a great eye for settings, using beaded curtains, mirrors, and other elements to considerable effect. 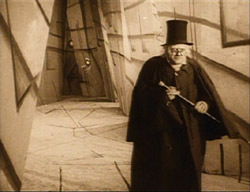 He made three films in 1918: Fyrvaktarens dotter, Nobelpristagaren,Nattliga toner, the first two of which were shown in the 1986 retrospective. Unfortunately since then the films have not been made widely available, either in prints or on DVD. Having not seen the two titles just mentioned since 1986, I can’t say that I remember them well enough to judge between them. So I’ll just leave all three films here, along with the advice to seize any chance you may get to see those or af Klercker’s other films. 9. Stella Maris, directed by Marshall Neilan, was the first of five features Mary Pickford starred in in 1918. 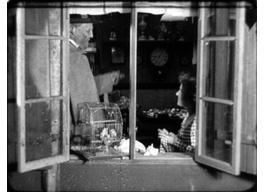 Its reputation lies mainly in the fact that Pickford played a double role, the bed-bound but lovely title character, and an ugly, slightly deformed orphan. In its outline, the story sounds abstract and overly symmetrical. Stella Maris’s relatives shut her off from all ugliness in the world, keeping her in happy innocence well into her teens. Unity, the orphan, has known nothing but deprivation. As Stella comes to glimpse the grim side of life, Unity is adopted and has glimpses of the beauties enjoyed by the rich. Both become miserable as a result. The overall implication is pretty grim. Stella’s world is initially wonderful only because everyone lies to her. She becomes embittered when she finally discovers this. At the heart of the tale is the deception that life is beautiful. Unity, who has not been deceived, knows better from the start. Even one brief reference to the war, as a troupe of soldiers passes by the estate where Stella lives, makes it seem tragic—this in a film that came out about two months after the U.S. had entered World War I. 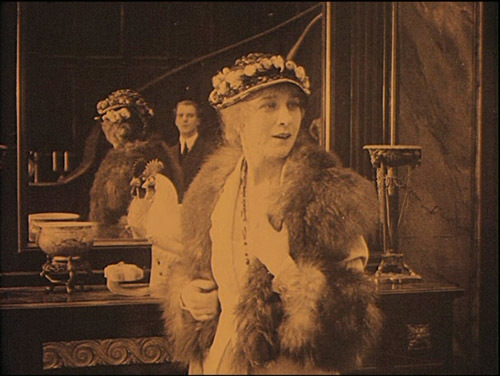 The balance between the two characters is made less artificial than it might sound by Pickford’s extraordinary performance—not so much as Stella, who is a rather passive version of the typical Pickford persona, but as Unity. The waif’s frequent disappointments and outright suffering create a strong effect that shadows even the quasi-happy ending. It’s a beautifully made film as well, with the use of glamorous backlight (as in the image at the top of this entry). Stella Maris is available on DVD from Image. 10. I have been hard put to find a feature to round out the list, so I’m substituting a group of shorts. They’re not masterpieces by any means, but each displays the talents of a great silent comic well on the way toward his most fruitful period. There’s no single great film to mark Harold Lloyd’s transition, but during 1918 he was developing his “glasses” character. He had had a modest success with his “Lonesome Luke” series from 1915 to 1917, where he essentially created a variant of Chaplin. In September, 1917, Lloyd first wore his famous black, lens-less glasses in Over the Fence. His early one-reelers wearing those glasses were still sheer slapstick, with little of the characterization that he would later develop to go with his new look. Arguably it was 1919 or even 1920 before he had fully nailed that persona. Still, during 1918 one can see him groping toward the formula. 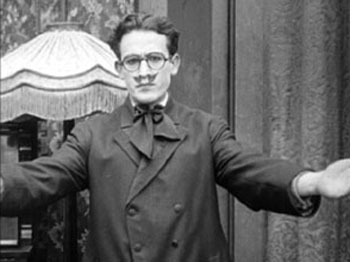 Kino’s “The Harold Lloyd Collection” volumes contain four films from that year, all co-starring Lloyd’s regular co-stars, Snub Pollard and Bebe Daniels. The Non Stop Kid (the title on the film; filmographies mistakenly give it as The Non-Stop Kid; May 21), Two-Gun Gussie (May 19), The City Slicker (June 2, all three on volume 2), and Are Crooks Dishonest? (June 23, on volume 1). The development clearly came in fits and starts. Two-Gun Gussie and Are Crooks Dishonest? are both slapstick affairs involving tricks and mistaken identify. The Non Stop Kid, though, has Lloyd in a more familiar situation, using his wits to foil a crowd of suitors and win the heroine’s hand. The City Slicker has a similar feel to it, though unfortunately the end is missing. The Non Stop Kid also has Lloyd donning a disguise in the form of a false moustache that somewhat resembles the one he had worn as Luke. This scene has a startling effect, blending the glasses character and the Luke character. 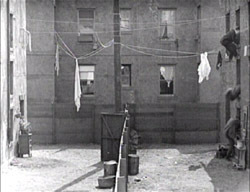 1917 and 1918 formed the high point of the string of comic shorts directed by Fatty Arbuckle, in which he also co-starred with Buster Keaton and Al St. John. When Keaton went solo, he proved to be a far better director than Arbuckle. 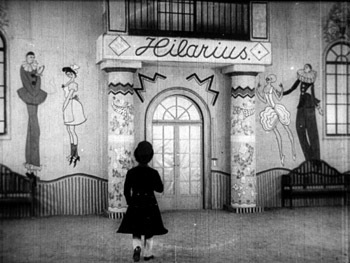 Arbuckle tended to simply face his camera perpendicularly toward the back of the set for every shot, just cutting to whatever scale of framing would best display a gag. Here it’s the perfectly timed and executed gags that dazzle, and the films are often hilarious. In 1918, the team made The Bell Boy, Moonshine, Out West, Good Night Nurse, and The Cook. The latter shows off Arbuckle and Keaton’s dexterity at juggling props and Fatty’s surprising grace, as when he improvises a Salome dance with a head of lettuce standing in for that of John the Baptist! The 13 surviving Arbuckle-Keaton films (some with missing bits) are available on Eureka’s definitive boxed set, “Buster Keaton: The Complete Short Films.” (That’s Region 2 format only, and available from Amazon UK.) Image’s “The Best Arbuckle Keaton Collection” has 12 films, missing only the more recently rediscovered The Cook. 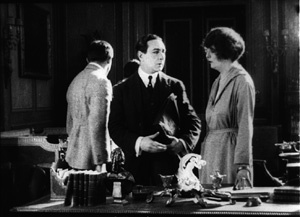 Image brought out The Cook on a disc with Arbuckle’s A Reckless Romeo (1917, sans Keaton). Kino’s two separately available volumes of “Arbuckle & Keaton” (here and here) contain 10 shorts total, again missing The Cook. Apart from all these films, it’s worth noting that in the world of animation, 1918 saw the release of Winsor McCay’s fourth cartoon, The Sinking of the Lusitania, and Dave Fleischer’s first, Out of the Inkwell, which launched the enduring series. Next year, 1919. Happy 2009 to all our readers!